Twice a year, I go through my entire stash and purge. I actually delete products that I am not going to use again. This idea can be hard to get used to, but over the years there are some useful tips that I’ve come up with that help me go through my stash efficiently and really free up some space. Today, I want to share those five tips with you. Go through and delete any old freebies you haven’t used, or won’t used again – We’ve all been there, downloading every free product we can find, whether we think we’ll use them or not. When I am purging, that’s the first thing I go for…all of those free kits or minis that I never have and never will use. Pick a time frame, and delete based on that – I usually go with a year. If I haven’t used the product within the year, it gets the boot. Sure there are somethings that are immune from that rule: holiday products, Disney products, and basics come to mind. Everything else is fair game. Know how you scrap – I tend to be a kit scrapper, and then I pull basics to use when I need them. Knowing this helped me figure out how I purged this time around. When I went through my stash, I kept a lot of basics – background papers, basic elements, basic journal cards. Unless I loved a kit and thought I would most likely use it again, it went into the trash can. Based on my scrapping style from the last 8 years, I was never going back to those kits so keeping the basics and letting the kits go made the most sense. Let it go, Let it go – It’s so easy to think “Oh, I’ll definitely use it again” but I’ve learned that this is rarely the case. 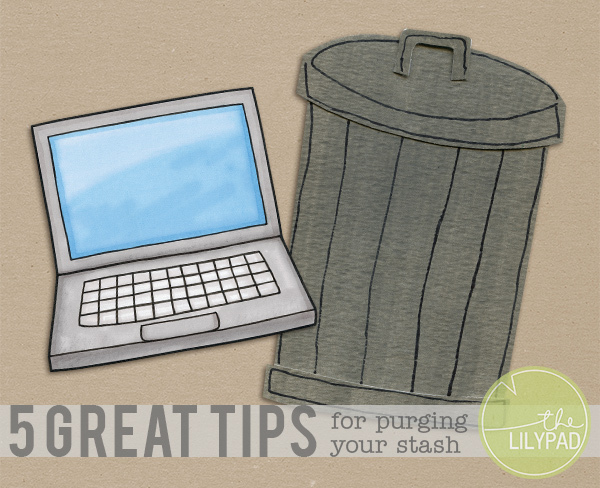 In my time in the digiscrap world, I’ve learned that I can’t hold onto things that I think I might use in the future. Digital hording is something that we all do, the struggle is real! I always remind myself of this: there will always be new kits, new papers, and new products I need. If this was paper, I would use it once and that would be it. I can let it go and it will be ok. If you are really undecided about something, but it into a separate folder labeled “6 months” – If you go and use the product within the six month period, move it back into your main folder. At the end of the six months, go ahead and delete the entire folder. What’s left in there are things that you haven’t used in the last six months, and therefore are good to be deleted. I’ve never gotten to the point where I had to delete some of my stash – I’ve never come close to running out of space. However, doing a clean up every so often really helps to keep things organized and manageable. Do you purge your stash? How do you decide what stays and what goes? Memory Pockets Monthly August Collection: Alamanc! My name is Nancy and I’m a digital hoarder! I need to do this! My hard drive is overloaded with freebie stuff I know I’ll never use dating back to 2006. My tastes have changed since then. Like the idea of the 6-month folder. Thanks for the tips. I can do this! These are great tips and suggestions. I just purged my stash. I usually do this in December, as the new year approaches, but felt an urge to purge. One of the key things that I do when organizing supplies is label them with the year that I bought them. For example, everything I’ve purchased this year, gets a “2015” tag. I also back up the entire kit to my EHD. THEN, I delete anything that doesn’t suit my taste. When I do a formal purge, I don’t touch anything from the last two years unless I have used it and it’s not a basic item, such as a glorious neutral background (can’t have enough whites!) I go through everything older and brutally hack away at things. I’ve been using the Konmari method in all aspects of my life…unless I still love it, it’s gone. But not really because the full kits are still on my EHD. I also keep the previews, in case I want to see what else went with a kit, when the contents have been deleted. I put everything in folders–according to themes, with subfolders i.e. Holidays (each named), Blog names, I think my cluster file has a million, so now I want categorize them. But one folder entitled “Awesome” with subfolders i.e. butterflies, scrolls, denim, envelopes, (things I really like), and that one is the one I really use. I need to purge, purge, because if they are child related, I know I will never use them, but if they are vintage or genealogy related, I will always keep them. Time or years has nothing to do with my purging.